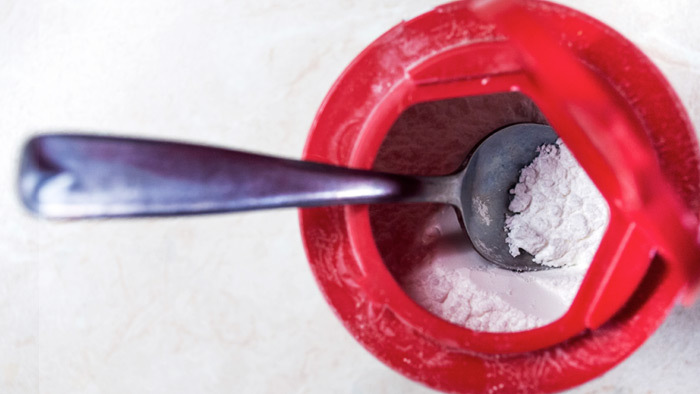 In part one of this article series we examined the chemistry of sodium bicarbonate (NaHCO3) and the basis behind its effects on enhancing athletic performance. Now that the mind-numbing biochemistry is out of the way, let’s talk about timing and dosing, available commercial formulations, potential positive psychological effects, and the side effects of use. McNaughton, Dalton, Tarr and Buck published a paper in Sportscience, a peer-reviewed journal and website for sport research, titled Neutralize Acid to Enhance Performance . This article provides an excellent overview of NaHCO3 use to enhance athletic performance. Over 30 different studies have been published on sodium bicarbonate loading prior to exercise. The consensus obtained is that the effective dose is 0.3 to 0.4 grams per kilogram of body weight. For example, if you weigh 70kg your dosing range would be 21 to 28 grams. It should be ingested 60 to 90 minutes prior to exercise in a minimum volume of 0.5 liters of water. There are a variety of commercial formulations available. The grocery-store-variety baking soda from Arm and Hammer contains 0.6 grams of NaHCO3 per 1/8 teaspoon. Read the labels on baking soda products carefully. Choose a product that just contains baking soda. There are products out there that contain other additives such as cornstarch. Be sure your product is fully dissolved in the water prior to ingestion. Drink slowly over a period of 20 to 30 minutes. This may not be the most palatable concoction you’ve ever ingested; refrigeration can help with the taste as well as adding a very small amount of clear fruit juice or fruit-juice based soda for flavoring. Since baking soda is used as an antacid for heartburn relief it is also found commercially over-the-counter as tablets and capsules in drug stores. Not only are these formulations significantly more expensive, their absorption rate is variable and it is difficult to adequately predict the necessary hydration with ingestion. Baking soda is also available in tablets specifically formulated for sports nutrition/hydration. Three of the popular manufacturer’s are Hammer Nutrition (Endurolytes Fizz), Zym (Catapult), and GU (Brew). These tablets are designed to be dissolved in 16 oz of water and that beverage consumed during training and racing. Intermittent bolusing with NaHCO3 has unknown effects on performance enhancement and certainly offers an opportunity for further study. There are many athletes I know who “swear by” the bicarbonate-based enhancing properties of these products. I confess myself to anecdotally feeling as though they have provided me with a performance benefit as well. Empirically, it would make sense that buffering intermittently during longer events should be beneficial. The GU product contains sodium and potassium in the form of bicarbonates. Zym and Hammer tablets also contain electrolytes to include magnesium as well as B vitamins. The Hammer product also contains L-Tyrosine and the Zym product contains caffeine. It is impossible to know which of these ingredients, or combination of ingredients, is actually beneficial. These tablets are not designed for pre-event loading as discussed above. Any level of acidosis in an athlete’s body can result in irritability and difficulty in focusing. It is possible that in addition to the positive physiologic effect there is an additive positive psychological effect to keeping acidosis at bay. We all know what it feels like to be in the “zone” when we are performing optimally. That gives us a mental and emotional boost during training and racing that can be extremely beneficial. This is a subjective experience and can’t be effectively scientifically studied but it may be that NaHCO3 supplementation can give us that exhilarating boost we need to sprint across the finish line after five hours of grueling racing. It’s well known that an athlete shouldn’t be using something for the first time in racing that hasn’t been trialed in training. There are some potential side effects (see below) to NaHCO3 usage and you definitely want to experience these (if they occur at all) in a training venue. If NaHCO3 acts to enhance your race performance it will also enhance your training performance. Better training performance equates with better race results. Use the same dosing and timing for use in your training regimes. As mentioned above, NaHCO3 can really be classified as a medication and as such it has side effects. One of the more common side effects is gastrointestinal distress in the form of cramping, vomiting, and diarrhea. One of the ways to avoid suffering this is to start supplementation at a lower dose and slowly increase it to the recommended range. Beginning with a dose of 0.1 to 0.2 grams per kilogram is a good starting point. Increase your concentrations over a series of workouts. There are unfortunately some more serious side effects potentially associated with NaHCO3 supplementation. They include muscle cramping and spasms, weakness, tetany, irritability, cardiac rhythm disturbances (which can be fatal), apathy, and seizures. These are all related to shifts in electrolytes (sodium, potassium, and calcium) in the fluid compartments of your body. It also can alter prescription medication metabolism and can prolong or diminish the effects as well as potentially result in toxicity. I encourage any athlete interested in utilizing NaHCO3 to consult with their healthcare provider prior to use. Athletes who are pregnant, breastfeeding, have high blood pressure and/or heart disease, suffer from kidney problems (even kidney stones), or have a history of electrolyte disturbances (including aldosteronism and Addison’s disease) should not consider supplementation with NaHCO3.